Recently Microsoft Office 365 SMTP implemented the mandatory use of TLS 1.2 which may cause issues with your Sharp MFP scanning to email. This procedure is for Sharp multi-function devices. Print your NIC page with the IP address of your copier. Open a web browser and type the IP(IPv4) address found on the NIC page into the address bar, hit enter. 2016 and newer models click System Settings tab, then click the Network settings button. Pre-2016 click Network Settings on the left menu. The fix is to add <brackets> to your sender address(2016-current) or your reply-to (pre-2016) then click Submit. Do you have any idea *why* this works? I ran into this same issue and somehow stumbled upon this solution with Office 365. However, I don’t know what it actually fixed. The printers we have are Sharp MX-M283Ns. I can’t find any information that states if these printers even support TLS 1.2. Personally I do not know why this fix works. It was the bulletin released by Sharp to fix the error for the time being. The MX-M283Ns likely do not have the TLS 1.2 support and probably will not since they do not update firmware for that model anymore due to the age of the units. Do you have the Sharp bulletin ref number? the in the TLS encryption language is the equivalent of // in Linux or DNS coding, basicly you are confirming to the encryption code that this text is here and it needs to use it otherwise the TLS protocol wont see the text inside that box. This is the only explanation we have and if someone can disprove me I would love to see it. But this is a huge oversight on Sharps side, no new Firmware or updates for a simple protocol change. And the really scary thing is coming the 31 of october when O365 implements TLS 1,2 and discard 1,1 and 1,0 and at this moment Sharp has no solution. Thanks for the explanation. What Sharp models are you working with? I know Sharp is working on this so if they release any firmware soon I’ll let you know. Thanks for the explanation, Technician Lima. I got lucky and fell into the solution with the brackets on about the 40th page of google searches… so only a morning’s worth. I’m pretty disappointed that we’re going to lose the ability to authenticate directly with the Sharp MFP’s to O365. And also how hard it was to find this fix! Just a note on the October 31st date–I don’t believe you’ll lose the ability to authenticate via TLS1.0 exactly then. At least the way I interpret this statement from Microsoft, it sounds like all ‘support’ will drop then. The official end cannot be far away though. Correct me if I’m wrong. “As of October 31, 2018, Microsoft Office 365 will remove support for TLS 1.0 and 1.1. This means that if you have issues connecting to Office 365 services because of weaker protocols, no support tickets would be generated. Please note: This is NOT when Microsoft Office 365 will officially deprecate TLS 1.0 and 1.1. So at first the Admin requested what kind of printers we had at the company at this time i have found these versions : MX2310U, mX2314n , MX-3640N ,MX-3560V , MX-5001N , MX-3060N, we might have some other sharp printers aswell but to us those are pretty much unimportant. And Matt I totally agree with you that this fix was way to hidden or not spoken off enough on the internet due to the magnitude of the issue. 1 : This means that if you have issues connecting to Office 365 services because of weaker protocols, no support tickets would be generated. 2: If you do not update to TLS version 1.2 (or later) on October 31, 2018, you may encounter problems when you connect to Office 365. If a problem arises with the use of an older version of TLS after October 31, 2018, you to update to TLS 1.2 as part of the solution. Technician, I think the models are different internationally than here, the only models above that we sold as commercial Sharps are the MX-2310U and the MX-3640N. The MX-3640N has a special firmware update to combat this issue. If you’d like me to send it to you with instructions on how to update the machine let me know. Thanks for the offer admin, but I got it concerning the MX3640N printers, i got hold of the update from a sharp friend of mine and the instructions, but the update firmware i got hold on is called Aries2_combi_0600A2I0_b.sfu which is 255873Kb large do you know Admin if this is the latest firmware ? because that firmware did not help, we still had to put the brackets in and I informed my friend of that and he called me back couple of hours later confirming it, Could it be a firmware diffrence or perhaps a diffrence between international printer vs State side printers ? Yes that is the correct file. If the models conflicted it would not have let you update it. I’m sorry to hear this didnt help. We got the “Scan to Email” fixed, but we cannot send “Email Alert and Status” for meter readings as such. Any thoughts on this. We are relying on Sharp to deploy firmware to correct this issue. Do they MX-M3050 and MX-7580N work? The firmware on those new models should have the TLS 1.2 support in them already. If you’d like I can email you the updates for the MX-2615N and MX-3140N. MX-M3050 and MX-7580N do not work for sending meter readings, either by internal or external email addresses. They do Scan to Email fine. Please send me firmware for the MX-2615N and MX-3140N. That’s all great, but how do I know if my device is pre or post 2016? What model do you have? The first digit of the serial number is the year it was manufactured. 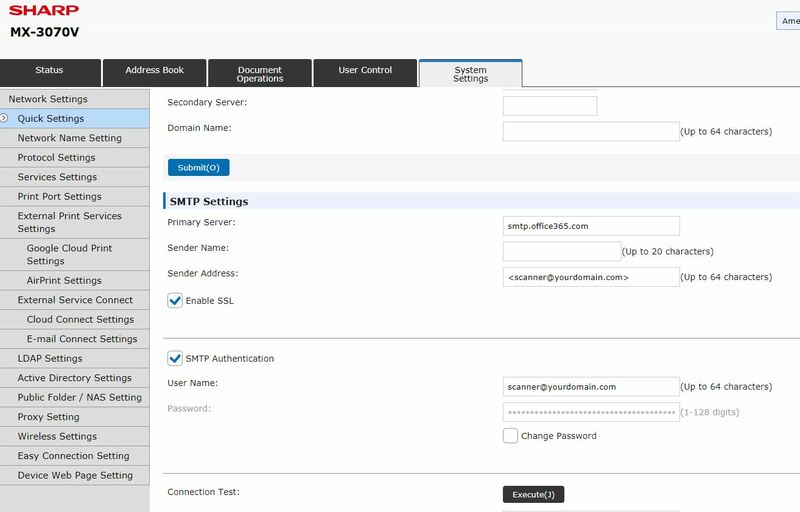 Office 365 SMTP requires an account for authentication. You have to have an account to create a connector. Microsoft must have done something last weekend. On Monday our VAR for our Sharp MFP’s came with a Sharp rep. They updated firmware and fiddled with various changes. On new machines – no carets at all on any of the 3 address locations. Scanning and status message both work correctly. On old machines – carets only on the reply address in the image send section. No carets on the smtp page at all on any machine. scanning and status message both work correctly. Yep, you have it right. The newer models don’t require it because they have support for TLS 1.2 out of the box. Some of the older models have special firmware updates to add TLS 1.2 support, some do not. This is no longer working as of yesterday for any of our offices. Any idea on a new fix? What model(s) are your Sharp devices? Currently using the MX-B402SC and MX-C301W. That’s what we were afraid of. Thanks for the information. Unfortunately, gmail is not an option for us. Sharp scanning to office 365 is not working at the same time scanning to gmail does. While setting to office 365, authentication is succeeding but still while trying scanning, showing network error. Tried putting the brackets for the email address, but still no change. What is the reason for this and how can we solve the issue please? Make sure the reply-to(sender email address) matches the email address you’re using for authentication. New problem with this solution , the meter reads , alert email is not send any more!!! This solution worked perfectly for our MX-3110N. However, like Dror mentioned, our meter reads and alert emails no longer work. Is there a solution for this? Whoever posted this article, thank you so much. I’ve spent two hours with Googling, and official articles from O365 but no help. This article beats them all. No need the for reply email.